With Imbolc approaching this week, I thought it would be appropriate to write something about Brigid (aka Bride), the triple goddess who is associated with this Sabbat. I think our impressions of goddesses are very personal, spiritual experiences. Some people like to take spiritual journeys to commune with deities and so different people have different impressions of what a god or goddess might be like. Brigid is associated with the element of fire. She is often portrayed with firey red hair -very Irish looking! 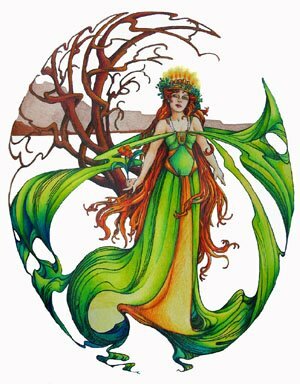 In fact, when I think of Brigid I think of the Emerald Isle. St. Brigid has been beloved amongst the Irish people since even before catholicism took hold. She was one of those clever goddesses who, when Christianity arrived, managed to morph into a saint through the love and loyalty of her people ;-)! On a personal level, my impression of Brigid is of a warm and caring goddess. She is very approachable and radiates the warmth of her firey element. Brigid will cheer you on when you are striving to reach your goals. Like your fire sign friends, she may lose her temper, but won’t stay mad for long. She will invite you to bring your troubles to her healing well and cast them in to lighten your burden. She is a triple goddess, embodying the energies of maiden, mother and crone. She also, in this aspect, rules over poetry, smith craft and healing. Being a healer, I like to remember Brigid for her healing abilities. At Imbolc this Thursday, a time of renewal, I plan to renew my dedication to my healing practice in Brigid’s honor. My friend and I will honor Brigid in our circle and feast around the fire pit in the cold winter air. Happy Imbolc and Blessed Be! Thanks for the post. Brigid is my chosen goddess as well.